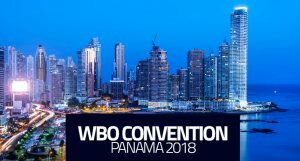 The World Boxing Organization (WBO) will have its 31st Annual Convention in Panama City at the Hotel El Panama Convention Center & Casino on October 29 to November 2. The WBO was organized after a group of Puerto Rican and Dominican businessmen separated from the WBA during its 1988 annual convention in Isla Margarita, Venezuela over conflicts on what rules should be applied. The WBO's first president was Ramon Pina Acevedo of the Dominican Republic. Immediately after its birth, the WBO held world championship matches around the world. Its first championship fight was for its vacant super middleweight title, between Thomas Hearns and James Kinchen where Hearns won by decision. The WBO next elected as president former world light heavyweight champion Jose Torres of Ponce, Puerto Rico. Torres relinquished the position in 1996, giving way to Puerto Rican lawyer Francisco Valcarcel as its new president. Valcarcel has held that position until the present. The WBO is recognized by the International Boxing Hall of Fame (IBHOF) as one of the four major world championship groups, together with the World Boxing Association (WBA), World Boxing Council (WBC), and International Boxing Federation (IBF). The WBO's headquarters is located in San Juan, Puerto Rico. The Boston Celtics have a storied rivalry with the Los Angeles Lakers, and have played the Lakers a record 12 times in the NBA Finals, of which the Celtics have won nine titles. Four Celtics players, namely Bob Cousy, Bill Russell, Dave Cowens and Larry Bird, have won the NBA Most Valuable Player Award for an NBA record total of 10 MVP awards. The 17 Boston championships were won in 1957, 1959, 1960,1961, 1962, 1963,1964, 1965, 1966,1968, 1969, 1974,1976, 1981, 1984,1986, and 2008. After his the end of his legendary basketball caree, Wilt Chamberlain played volleyball in the short-lived International Volleyball Association. He became president of this sports organization and he was enshrined into the IVA Hall of Fame for his valuable contributions to the sport of volleyball. HBO recently announced they would no longer feature boxing as part of their programming. HBO World Championship Boxing's first event was the fight where George Foreman defeated Joe Frazier to win the world heavyweight championship. Famous HBO matches include The Rumble in the Jungle, where Muhammad Ali regained the world heavyweight title from George Foreman; Thrilla in Manila, the third match between Muhammad Ali and Joe Frazier; Larry Holmes vs. Gerry Cooney, for the WBC heavyweight championship; The Battle of the Champions, when Aaron Pryor defeated Alexis Arguello in their first fight. Rocky Fielding, the next Canelo Alvarez foe, is a 31-year-old fighter born in Liverpool, Merseyside, England. He is the current WBA regular super middleweight champion and former WBA intercontinental super middleweight champion. He was once the British, Commonwealth and English super middleweight champion. He has 27 wins, 15 wins by KO, and 1 loss dealt by fellow Englishman Callum Smith by first round TKO on November 2015 for the WBC silver and vacant British super-middleweight titles. Shawn Porter is a two-time welterweight world champion, having held the WBC title since September 2018, and previously the IBF title from 2013 to 2014. As of September 2018, Porter is ranked as the world's number four welterweight by The Ring magazine, the Transnational Boxing Rankings Board, and BoxRec. He has 29 wins, 17 wins by KO, 2 losses and 1 draw. His two losses were dealt by Kieth Thurman by unanimous decision and Kell Brook by majority decision. Michael Conlan had a highly successful amateur career, being ranked No.1 in the AIBA world rankings at bantamweight. He won an Olympic bronze medal in London in 2012, Commonwealth Games gold medal in Glasgow, Scotland in 2014, European Championships gold medal in Samokov, Bulgaria in 2015 and a World Championships gold medal in Doha, Qatar in 2015. He became one of Ireland's most decorated amateur fighters of all time. He had a controversial exit from the 2016 Rio Olympics where he protested a quarterfinals loss. Since then Conlan turned pro winning nine straight wins, six of them by stoppage.